How to Get from Lisbon Airport to Cascais? Are you visiting Portugal soon? If you are travelling to Cascais, most likely you will arrive at Lisbon Airport. To appreciate a comfortable journey from Lisbon Airport to Cascais a good and economic alternative to avoid all the hassle of public transports and expensive normal taxi fares is to book a private Lisbon Airport transfer to Cascais. We will transport you directly between Lisbon Airport and your accommodation in Cascais, both for your arrival and departure flights. Select Cascais as your transfer destination area and provide us with flight details, Cascais accommodation address and contact. We automatically process your request for transport availability to Cascais and send a booking voucher with your transfer confirmation in a matter of seconds. At Lisbon Airport arrivals terminal a friendly driver will be waiting for you next to a placard with our website logo. For the return transfer we will pick you up from the same address in Cascais. And remember, you can always pay later to the driver for both your arrival and return Cascais transfer. How far is Cascais from Lisbon Airport? How much will it cost? How long? The travel distance between Lisbon Airport and Cascais is 30Km and transfer time takes approximatly 35mins under normal traffic conditions. Private taxis for Lisbon transfers to Cascais with fixed rates. A much more faster, affordable and hassle free transport to Cascais alternative. One of our friendly drivers will meet and greet you at Lisbon Airport arrivals hall and assist you with all the luggage. He will guide you to your assigned transfer vehicle, which may vary from an estate or executive saloon for up to 4 passengers to a modern mini-bus or people carrier van up to 16 passengers. You will be relaxing at your Cascais resort, hotel or private villa in approximately 35 minutes. With an undisputed seaside resort status, with attractive seascapes and natural sights, the former fishing village of Cascais is surrounded by popular beaches to the west, such as Guincho (favourite among surfers) and by the beautiful Sintra mountains and palaces to the North. 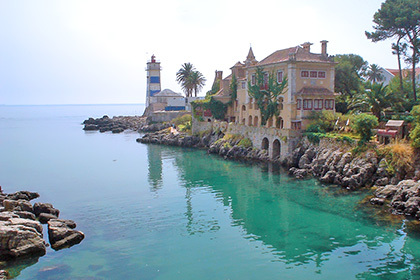 Just 30km west of Lisbon, the nation’s capital, Cascais gained fame when the Portuguese royal family started spending their holidays there in the late 19th century. Also, because of Portugal’s neutrality during the second world war, the town’s royal past and elegance, Cascais received many exiled royal families from Europe who started living there. Nowadays is a very popular place for week-ending and travellers. Has lots of good restaurants and bars of varying cost, a large yacht harbour, charming five stars hotels and cobbled streets in a very sophisticated environment. With serveral golf courses nearby its becoming a popular golf destination as well. Our private transfer service at Lisbon Airport will transport you directly to and from any resort, hotel or private holiday villas / apartments in the Cascais area. To pre-book taxi transfers from Lisbon Airport to Cascais or to other near by destinations take a look at our full list of taxi transfers fares & prices for all the covered locations in Portugal.